Storage Spaces Direct is one of the coolest feature in Windows Server 2016. For those who don’t know what Storage Spaces Direct does, it is Microsoft software-defined storage solution which allows you to use local-attached drives as storage for your Hyper-V cluster for example. You can read more about it here. Software Storage Bus is the core of the Storage Spaces Direct because it’s a virtual storage bus that spans all the server that make up the cluster. 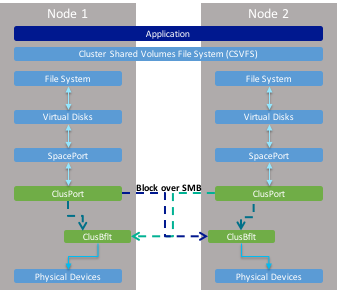 Software Storage Bus allows each server to see all disks across all servers in the cluster and it’s made up of two components: ClusPort and ClusBlft. Clusport implements a virtual HBA that allows the node to connect to disk devices in all the other servers in the cluster. ClusBlft on the other side implement virtualization of the disk devices and enclosure in each server for ClusPort in other servers to connect to. Software Storage Bus has an access algorithm which makes sure that all devices from all servers have access and it also has an algorithm for IO prioritization that prioritizes Application IO over System IO. The Software Storage Bus cache is scoped to each server and is resilient to failures because it sits underneath the virtual disk, which provides resiliency by writing data copies to different nodes.